Travis L McIntire, a 26-year veteran in the hotel industry, joins the staff at Wyndham Hotels of Galveston as Complex Director of Catering for Hotel Galvez & Spa® and The Tremont House, both Wyndham Grand® Hotels. McIntire comes to Galveston from the Houston Airport Marriott at George Bush Intercontinental where he worked as senior catering sales executive. McIntire has a bachelor’s degree in Restaurant, Hotel & Institutional Management from Texas Tech University. He got his start in the hospitality industry by working as director of food & beverage at Ramada Hotel Astrodome/Medical Center in Houston and later moved on to Houston Marriott West Loop and J.W. Marriott Houston working in catering. He is a certified wedding planner for Marriott and has a history of hitting 100 percent of his catering goals handling corporate, fraternal, medical, government, military, religious and educational groups and closing on catering for groups of up to 1,000 guests. He is a member of the National Association of Catering Executives and a lifetime member of the Houston Livestock Show & Rodeo, where his Sky Riders team was the 2014 Sales Team of the Year for the prestigious Carnival Ticket Sales Committee. He received numerous sales achievement awards during his career including Golden Circle: President’s, Silver and Bronze Sales Achievement Awards while at Marriott Hotels. In his role as Complex Director of Catering, he is tasked with leading his team to increase events booked in the hotels’ 27,000 sq. ft. of combined meeting space at Hotel Galvez and The Tremont House. Wyndham Grand® Hotels and Resorts are an ensemble of distinguished hotels within the Wyndham® Hotels and Resorts brand that represent one-of-a-kind experiences in key destinations with refined accommodation, attentive service and relaxed surroundings. For more information, visit www.wyndhamgrand.com. Wyndham Hotel Group is the world’s largest and most diverse hotel company, encompassing approximately 7,540 hotels and 650,200 rooms in 71 countries. Additional information is available at www.wyndhamworldwide.com. For more information about hotel franchising opportunities visit www.whgdevelopment.com. 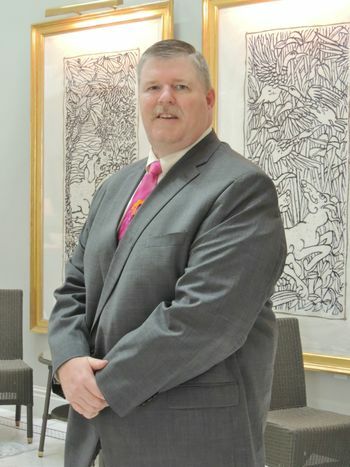 Travis L McIntire, a 26-year veteran in the hotel industry, joins the staff at Wyndham Hotels of Galveston as Complex Director of Catering for Hotel Galvez & Spa® and The Tremont House, both Wyndham Grand® Hotels.